Your one stop location for photos of anything nature. Nature Photography galore! 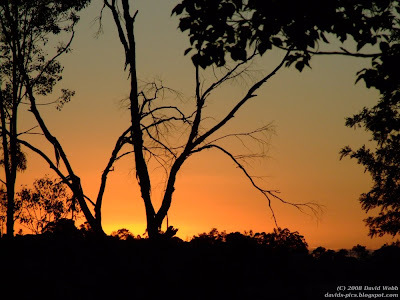 Nature Pictures by David Webb Photography include images of flowers, flora, fauna, macro, beach, Australian landscapes, Australian culture, Photography Tips and more. Today is the Seventh Day of Christmas. The "seven swans a-swimming" refer to the seven gifts of the Holy Spirit: wisdom, understanding, counsel, fortitude, knowledge, piety and fear of the Lord. Today is the Sixth Day of Christmas. The "six geese a-laying" are symbolic of the six days of creation, the biblical account in which God creates the universe and it's inhabitants. Today is the Fifth Day of Christmas. Everyone should remember this verse! The well-known "five golden rings" represent the first five books of the Bible, also called the Jewish Torah or the Pentateuch: Genesis, Exodus, Leviticus, Numbers and Deuteronomy. Today is the Fourth Day of Christmas. In this verse, The "four calling birds" refers to the four evangelists who wrote the Gospels—Matthew, Mark, Luke and John—which sing the song of salvation through Jesus Christ. Today is the Third Day of Christmas. In this verse, the "three French hens" stand for faith, hope and love—the three gifts of the Spirit that abide (1 Corinthians 13). Today is the Second Day of Christmas. In this verse, the "two turtle doves" refers to the Old and New Testaments. Merry Christmas everyone! I hope you are filled with the peace and joy of the season, as we celebrate the birth of Christ over 2000 years ago. Catholics in England during the period 1558 to 1829 were prohibited by law to practice their faith either in public or private. It was illegal to be Catholic until Parliament finally emancipated Catholics in England in 1829. "The Twelve Days of Christmas" was written in England as one of the "catechism songs" to help young Catholics learn the basics of their faith. In short, it was a coded-message, a memory aid. Since the song sounded like rhyming nonsense, young Catholics could sing the song without fear of imprisonment. The authorities would not know that it was a religious song. "The 12 Days of Christmas" is in a sense an allegory. Each of the items in the song represents something significant to the teachings of the Catholic faith. The hidden meaning of each gift was designed to help Catholic children learn their faith. The better acquainted one is with the Bible, the more these interpretations have significance. The first day, of course, is Christmas itself. But the "true love" referred to is no earthly love. The song refers here to God himself, who is the "true love" of every Christian. This is the foundation of the song, on which every other verse builds. The "partridge in a pear tree" is Christ Jesus upon the Cross. In the song, Christ is symbolically presented as a mother partridge because she would feign injury to decoy a predator away from her nestlings. She was even willing to die for them. The tree is the symbol of the fall of the human race through the sin of Adam and Eve. 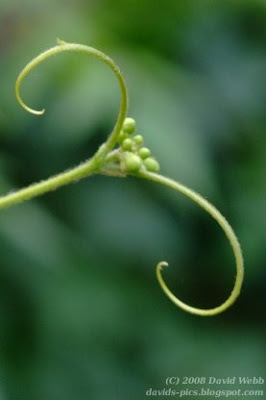 It is also the symbol of its redemption by Jesus Christ on the tree of the Cross. Over the next 12 days of the Christmas season (ending on January 6th "The Epiphany") I'll post more information about the following verses of this song. I hope you'll find the "coded" meanings as interesting as I have! For more information, you can also check out the sources below. A few nights ago, a friend rang up from Brisbane saying "step outside and have a look at the moon!" So I went out to see what all the fuss was about - and then smiled. The moon and two "stars"* were aligned perfectly to create a smiling face.The mouth was formed by the brilliantly gleaming crescent moon, with two tiny spots of light above representing eyes. It was almost as if God was looking down on us saying "Good night!". So remember to smile today. Everyone needs a smile, and it's something you can always give away without running out! Who knows what good a simple smile could do to brighten someone's day. 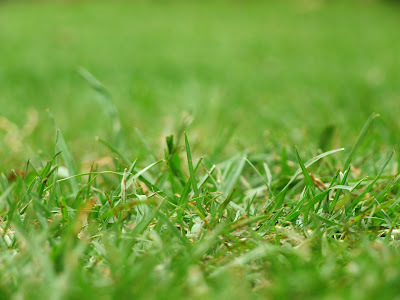 This photo taken with the Fujifilm S9600 digital camera. * Yes, I know, they were actually the planets Jupiter and Venus, not stars. But I never let the facts get in the way of a good story! NASA has a wonderful picture of the event - you might like to check it out for a further explanation. It's been quite rainy here recently. 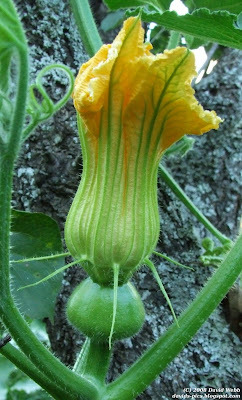 This has given the grass - and weeds - a chance to grow. Dandelions in particular have taken over our lawn. 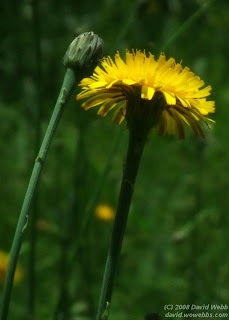 This picture shows two dandelion flowers - one open, and one closed. 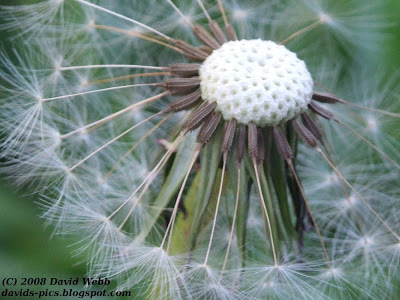 You might also like to check out my picture of the next stage in a dandelion's life. "Submission" is the title I chose for this photo in a recent photography competition. I don't know exactly why, but it seems to fit the photo somehow. 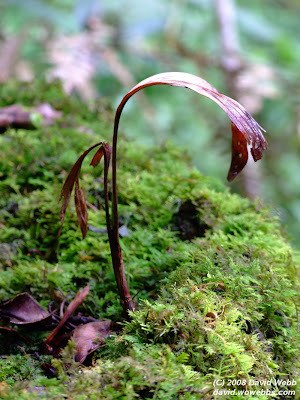 Perhaps it's the modest curve of the leaves, which give it a rather frail and gentle air. 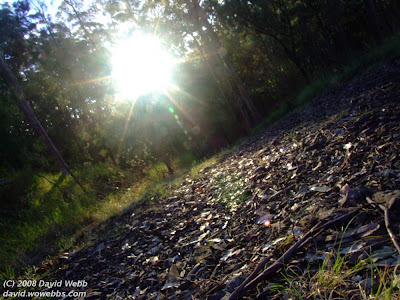 This is another one of my Goomburra shots, taken while walking to the Cascades. 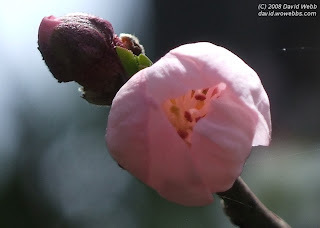 I hope you enjoy the pictures of Spring here, wherever you are in the world! These photos taken with the Fujifilm S9600 digital camera. This blog's had so many WYD photos recently that you could be forgiven for thinking it's no longer a "nature photography" blog! But never fear, today I re-introduce the old theme again. 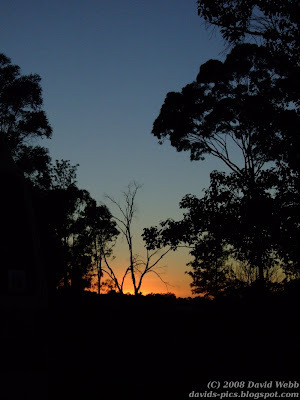 This photo was taken on my not-so-recent holiday to Goomburra. I was quite surprised at the way the water turned out - there is a very distinct blue-ish tinge to the whole image, and the fall itself seems to be falling through a veil of dark blue. There is a certain atmosphere to this picture which I can't quite define, but the word "Mystery" seemed relevant to me. What does this picture make you think of? During World Youth Day, the streets of Sydney were lined with these banners. I got this photo at Darling Harbour - right along the side of the water these flags were flying high in the air. They made a great subject for a photo - the foremost banners are receding into the picture, and you can even see a few more standing straight in the distance. Now that the WYD activities are starting to finish up, it's time to look at "Where to from here?" The experience of the week is one to treasure, but also one to move forward from. So far we've had meetings where young people shared their experiences from WYD, and joined together again in song and worship. Some people have also started organising youth groups and ongoing plans, so that we can keep the spirit alive. Already people are noticing that those who went to WYD have been much more joyful and friendly since they returned, and that it has spread to others as well. It's really been an awakening for all of us, young and old alike, to reconsider our life's mission and our interaction with friends and family. 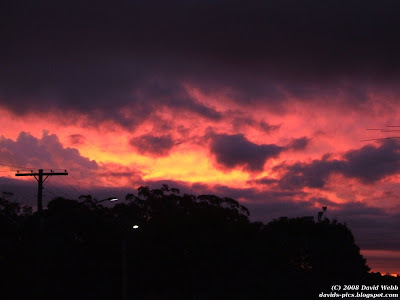 This photo taken with the Fujifilm S9600 digital camera.It is one of a series of photos commemorating the occasion of World Youth Day Sydney 2008. Some of you might have noticed that I haven't been replying to comments lately. I'm getting a lot more comments than I did a year ago on this blog, and I thank you all for giving your feedback. Unfortunately they are getting too numerous for me to reply to each one individually as I had a custom of doing. From now on I will only reply to any comments that require a direct response. This means if you ask a question, or request a picture for example, I will try to reply as soon as possible. If you've simply got a compliment or suggestion, please do tell me, but I won't be able to guarantee a personal response. I can guarantee that I read each and every comment though. Your thoughts are very much appreciated, and please keep them coming! I took this photo during World Youth Day, on the night of the opening Mass. This is basically the view I had while trying to move through the throngs of pilgrims crowding the exit points. The colourful beanies are not just for show - it was quite cold that night! As soon as the opening Mass had finished, people were crowding around every exit point trying to find a way out. It was difficult to stay together as a group in such a crowd, so we just stayed put and enjoyed the beautiful sight of Sydney during WYD at night! This photo taken with the Fujifilm S9600 digital camera. It is one of a series of photos commemorating the occasion of World Youth Day Sydney 2008. I'm back from Sydney now, where I have been on holiday during World Youth Day for a few weeks. And what a time it's been! World Youth Day 2008 was definitely the most memorable experience of my life. The whole week was a time of great joy and faith in Sydney, and the entire world. For those who were watching, I documented some of my experiences during WYD on this blog. In the upcoming weeks I will run a series of photos here relating some of the key events that occurred during the time of WYD. The video shown above is a compilation of photos taken by me and my brother who also attended, to the WYD theme music "Receive the Power" by Guy Sebastian and Gary Pinto. World Youth Day was special for me in many ways. Firstly, I was able to come together with youth from all over the world - over 170 nations - to unite and share experiences and culture. I met many new people, especially from Canada and Chile, with some of them even offering places to stay if I ever travel to their part of the globe! The number of flags visible was amazing, and everyone was very willing to share culture and faith. One of the most beautiful things about World Youth Day was the atmosphere. There was a great sense of peace and friendship that I have never before felt in Sydney, or anywhere else for that matter. Everyone was ready to lend a hand with directions or whatever happened to come to hand. And an amazing thing happened - you were able to step on a train in the middle of Sydney and be greeted with a cheery "Hello!" or perhaps even a song. I don't know what it's like in other parts of the world, but normally in a big city in Australia if you say "Hello" to someone you're likely to get a cold stare. This transformation that came about was certainly beautiful to behold. Another great thing was the hope and joy I saw in the young people around me. They all had a hope in the future that is becoming rare today, and rejoiced in the current moment without "stressing out" about the dozens of things that could have been worrying them. Without being careless, everyone was able to maintain a joyful attitude which also helped them to care for others. There's no way I can describe everything that World Youth Day has been for me in mere words. I hope that this and the next few posts will convey some of what I have experienced, but as with any great moment it is impossible to explain fully. I can only say that it has been a life changing event for me and many others, which I will be building on for the rest of my life. Has there been a great moment in your life, or a life-changing experience you would like to share? Leave a comment and discuss what has been special to you. This photo really has to be seen full-screen to be fully appreciated. Click on the picture above to view the orb web spider full-size. I caught this big Orb Web Spider under a tree one day. He was alive, but being quickly overrun by ants. So I flicked the ants off, and snapped a few pictures of him. He wan't very eager to move (all the better for me! ), maybe the ant's had bitten him too much. The Garden Orb Web Spiders are also called Araneus Spiders, Garden Orb-weaver, Wheelweaving Spiders or Orbweaving Spiders. The Latin or Scientific name is Eriophora transmarina. 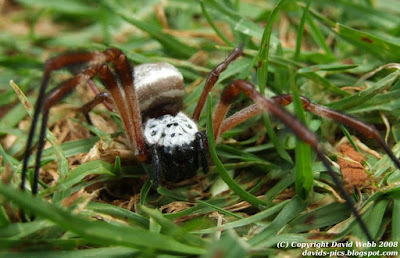 More information on the Orb Web Spider. July 15th 2008 marks the beginning of the biggest gathering in Australian history. World Youth Day, an international Youth Festival organised by the Catholic Church will be held in Sydney, Australia this year. From July 15-20 nearly 150,000 international visitors will converge on Sydney for this event. The final Mass is expected to attract crowds of up to 500,000 making this easily the biggest gathering of people ever in Australia. As you can guess, I'm pretty excited about this event. I will be attending along with most of my friends. The Pope will be coming to Australia for World Youth Day, so hopefully I'll catch a glimpse of him too. :) Others who can't visit the events live will watch on TV. Over the 5 days international visitors are expected to bring over $120 million in revenue to Australia, so it's going to be a big economic boost for Sydney as well. Some Sydney residents are concerned though, due to the transport difficulties with the huge numbers of people. In fact, Randwick Racecourse was chosen as the location for the final Mass due to the crowds - this is the only stadium which can accommodate enough people, and even with it's size 350,000 will have to overflow into Centennial Park! I'm going to be leaving for WYD on the 10th, and probably only arriving back at the end of July. I have scheduled some posts for the meantime, and will also try to blog about World Youth day as it happens, thanks to the new mobile phone. For updates, check my new blog: http://david-worldyouthday.blogspot.com. For those who have given me awards - I haven't forgotten you, and will try to post them after I get back. For those of you who commented on my last post, your guesses were all very close, but none of you managed to get it exactly right. The "Guess What" picture (right) was actually a close up of moss growing on a wet rock. What some of you thought was sky is actually the water flowing in the background of the picture. 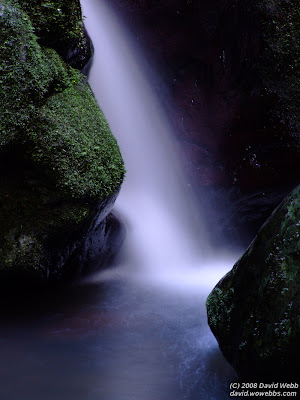 The photo shown above is a zoomed out picture of that moss, with water flowing from a waterfall between the rocks. This photo was taken with a fairly long exposure, in order to create the smooth "flowing" of the water. 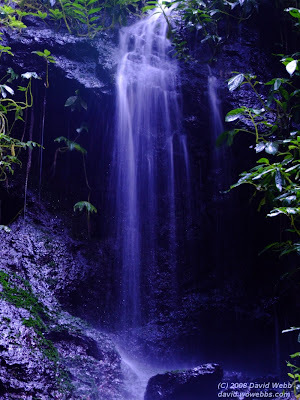 Anyone who has visited Goomburra National Park will probably recognise this waterfall - it's at the bottom of the Cascades, one of Australia's most well-known waterfalls. Although it's quite small (only about 5m high), the Cascades are a great place for a photo, and the water in the stream below makes a very fresh drink after a long walk. It's been quite a long time since I last posted here, and a lot's happened in that time. For those loyal readers that have kept watch here in my absence, I'll try to summarize what's been going on. Firstly - Water! I went on a holiday to Goomburra National Park over the Queen's Birthday weekend, and there was lots and lots of water there! As anyone who's been following my blog will know, there isn't much water where I live so this was a special event. I took about 1,200 shots in the 36 hours, and got quite a few good photos out of the trip. Over the next few weeks I'll try to post some of those shots here. 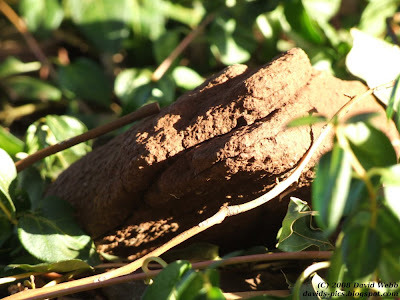 Update: The photo above was taken at Goomburra - can you guess what it is? For the answer, click here. I've also had exams in the past week, so I've been focusing entirely on study and didn't have time to work on this blog. Consequentially the traffic has gone down from about 300 visits per day to 160. Hopefully with a bit of regular posting this might come up again, but as I've said before, traffic ain't everything! Finally, there's going to be another interruption to the posting schedule again soon. I'm travelling to Sydney in about a week's time for World Youth Day - an international gathering of youth that will attract 120,000 overseas visitors to Australia. I'm not sure if there will be internet access available, but if there is I will certainly try and get some photos up during WYD. So, that's about all for now. Thanks a lot to the people who have stayed around during the quiet period in this blog, I will try to get around to your websites soon, but can't guarantee anything until August! 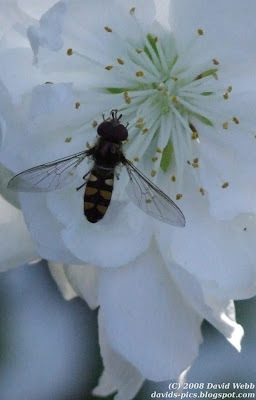 I'm not going to be able to post a Wordless Wednesday photo today, due to intensive study schedules and job timings. If you have any time though, I'd appreciate a comment on some older posts. So far there are over 200 posts to choose from, dating back to late 2006. Update: No Sky Watch Friday either. 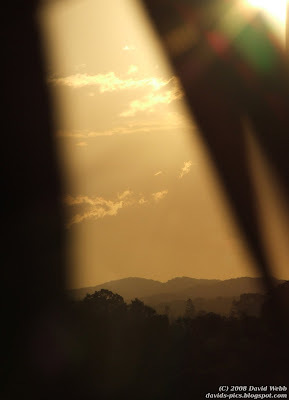 Here's another sunset taken at the Indooroopilly golf club. I particularly like the "peach" colour of the sky here - this picture is the type which I like for a desktop background. How do you like the colours in this picture? Too soft for your taste, or just right? We're really into Winter here in Australia. The sun isn't rising now until about 6:20am, which means that I'll often get up when it's still dark. This is great for capturing sunrises, although it's not too conducive to getting out of bed! Another benefit of capturing sunrises during Winter is that the atmosphere is usually very clear. Often when the sun comes up there will be no clouds or haze in the sky, just a clear, cold morning. 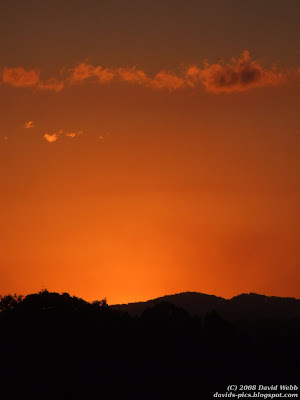 Of course, this means that the sunrise will look very different, and it is sometimes harder to get a good sunrise without any clouds. I'm hoping to wake up early enough one of these days to get the sun rising over the valley - landscape shots tend to work best on clear mornings. "It was a dark and stormy night..."
I know, you've probably heard that title too many times already. It's one of the most under-rated and over-quoted verses in history. But I couldn't think of a better title for this picture, which was taken late one stormy night. The trees are back-lit by a flash of lightning, fading out as it reaches the top of the picture to reveal the dark storm clouds. You might also have noticed something familiar about these trees. Yep, you guessed it, this is the same easterly viewpoint seen in many other photos. Somehow, whenever there's an interesting sky around, it has to sit behind these trees. All I can really do is change the angle! 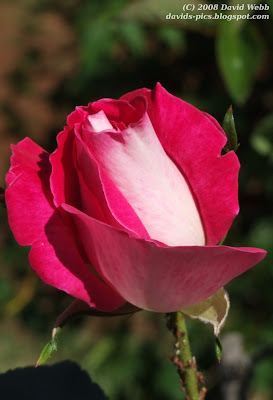 "A rose by any other name...."
"Time to stop 'monkeying' around!" I caught this monkey taking a break at the Dubbo (Western Plains) Zoo last year. It seems an appropriate photo for today's post, as I've just finished a hectic week of playing at the Eisteddfod (along with younger siblings who were in other sections). One of the pieces I played in this year's Eisteddfod was Beethoven's "Moonlight Sonata", Opus 27, 3rd Movement ("Presto Agitato"). This is a quite an "agitated" piece, and certainly makes for a great performance, if you can play it well. Recently I found a video of Rowan Atkinson (better known as "Mr. Bean") miming this piece, along with the first movement of Beethoven's "Sonata Pathetique". His performance is quite clever, and very amusing for anybody who's played either of these pieces. I've included the video below, and highly recommend you check it out. This guy is really amazing! "A New way of looking at life"
You've all seen these trees before. You've even seen these trees with the moon. But have you seen them at this angle before? Sometimes it's good to step back and take a different view of things. Today is Mother's Day, as you probably already know. People across the globe are honouring the dedication and value of mothers by giving gifts and other signs of appreciation. And with good reason - after all, without mothers none of us would have ever been born! I'd like to share with you today a little bit of history about Mother's Day that you might not have heard before. Anna Jarvis of Philadelphia, whose mother had organized women’s groups to promote friendship and health, originated Mother’s Day. On May 12, 1907, she held a memorial service at her late mother’s church in Grafton, West Virginia. Within five years virtually every state was observing the day, and in 1914 President Woodrow Wilson made it a national holiday. Over time, what had originally been primarily a day of honour became associated with the sending of cards and the giving of gifts, however, and, in protest against its commercialization, Jarvis spent the last years of her life trying to abolish the holiday she had brought into being. I'd also like to say a big "Thank you" and "Happy Mother's Day" to my own mother today. I know you are reading, so thanks for all you've done! I was at a baptism in Brisbane this week, and the service ended with refreshments available at the Indooroopilly Golf Club. 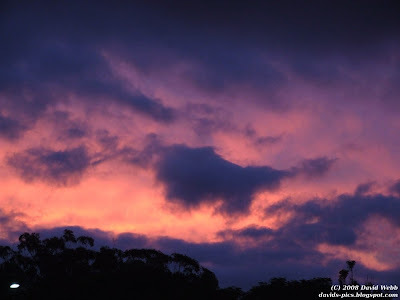 It was late afternoon by the time we arrived, and in the "Jacaranda room" I had an excellent view out to the west, where the sun was setting over the golf links. Somewhat surprisingly, the best framing I could find for the sunset was to zoom right in to 300mm, excluding the golf links entirely and silhouetting the mountains in the distance. The photo above was taken at about 4:30pm, before the sun began to set properly. I was walking through a doorway, and caught a glimpse of the mountains through the leaves of this plant. So, out came the camera for a quick shot! The leaves give an interesting tilt to the image, framing the mountains and drawing your eye along a diagonal path. I know some of you are have been using Blogger in Draft to schedule your posts recently. This functionality is now available in the standard blogger interface. Simply create a new post, and click "Post Options" to access the date settings for your post. Set a date in the future, click "Publish", and your post will automatically be scheduled for posting on the date you chose. This feature can be very handy when you have "writer's block" and can't manage to write to a deadline, or just want to take a break for a while. I encourage you to give this feature a try - you might find it comes in useful some day. "Don't worry about the future...."
On Wednesday I got up around 6am, just before the sun rose, and was able to capture this shot. Once again, this sunrise is different from all my previous shots. Watching the sun rise helped me to stop and forget all my worries of the future, just take a moment to relax and enjoy the present. I hope you can also take some time one day soon to watch the sun rise. Each one is different, so you'll be guaranteed of a fresh show every day. This Sky Watch Friday photo taken with the Fujifilm S9600 digital camera. I'd like to point out a new feature that I've added to this blog recently - related posts. If you click on any post, you'll find a list of related links at the bottom of the page, just below the comments section. You might like to check out some of these - the photos go back to late 2006. Wow! 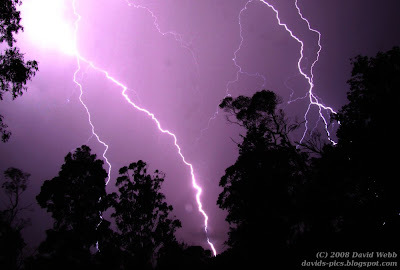 That's what I thought when I saw this lightning bolt strike last night. 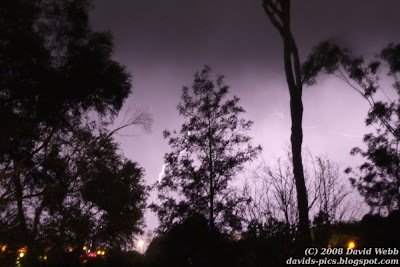 We had a thunder storm here (fairly rare, I might add) and so I went out, like I did during our last lightning storm, in the cold and wet, to get some lightning photos. The noise of this particular strike nearly deafened me! It struck less than 1km away, so the thunder came almost instantaneously. I took this picture on "B" shutter mode with about a 20-second exposure at F6.4. The lightning you see in the picture is actually the result of two strikes - one huge lightning strike (the large ball of white lightning on the left), and another smaller one almost directly after. Because of the long exposure, and the brightness of the lightning, I had to use the GIMP to adjust the saturation curve for this image to make the lightning bolts visible. But I can assure you it isn't "touched up" in the common sense of the word - this is exactly what it looked like in real life! Even though I only saw the lightning for a second, I can still see the strike as if it was right in front of me now. And I can hear the thunder just as clearly - it was the sort of sound that's so loud and deep that you can feel it as much as hear it! This Thunder-bolt Sky Watch Friday photo taken with the Fujifilm S9600 digital camera. Anzac Day, April 25 in Australia and New Zealand commemorates the landing in 1915, during World War I, of the Australian and New Zealand Army Corps (ANZAC) on the Gallipoli Peninsula. The Allies attempted to take control of the strategic Dardanelles from Turkey, allied with the Central Powers, in the so-called Dardanelles Campaign, which began in February 1915. ANZAC forces landed on April 25 and secured a beachhead at what came to be called ANZAC Cove, on the Aegean side of the peninsula. Despite additional landings by other troops during the succeeding months, the Allies could not capture the strait, and they suffered enormous losses from battle and disease. By December 1915 the Allied troops, including the ANZAC forces, had been withdrawn. Nonetheless, the ANZAC troops earned a reputation for valiant fighting, and they then served with distinction in France and in the Middle East. Later, in 1917, the Australian and the New Zealand forces were separated, and ANZAC thus ceased to exist. In 1920 Australia and New Zealand created ANZAC Day as an official holiday to honour those who had fought in the Dardanelles Campaign. Since then it has been broadened to become a memorial day honouring all who served and died in World Wars I and II and in the Korean and Vietnam wars. It is a public holiday marked by religious services and parades and by ceremonies in which veterans participate. The Cook Islands, Tonga, and Samoa also observe the day. 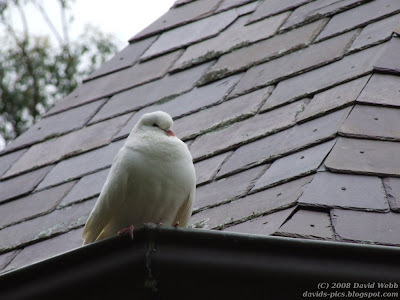 This dove represents peace in the world. The bird, perched high on the roof of a shrine, is looking out over the world wisely, and is at peace. We in Australia are thankful for the peace we do have, and for those who have gone before us defending that right. Not only Australians, but everyone in the world should remember the ANZACs and all like them with gratitude today, and look forward with hope to the peace of the world to come. 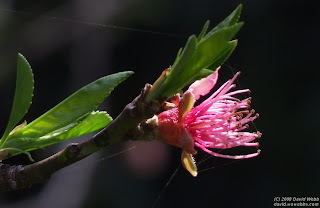 This Wordless Wednesday photo taken with the Fujifilm S9600 digital camera. Encyclopedia Britannica is well-known as a reputable source of information. Over 4,000 editors who are recognized as experts in their field help to maintain well-written and accurate articles in this classic reference. Unfortunately the encylopedia has been somewhat neglected nowdays, with the advent of Wikipedia which offers free access to all articles. For every article viewed on the pay-for Britannica Online, an estimated 187 articles are viewed on the free Wikipedia. This may be set to change though - you can now get access to the online version of Encyclopedia Britannica for free through a new program called Britannica Webshare - provided that you are a “web publisher.” Bloggers are included in this invitation: “This program is intended for people who publish with some regularity on the Internet, be they bloggers, webmasters, or writers. We reserve the right to deny participation to anyone who in our judgment doesn’t qualify.” I signed up for this program, and now have access to all 65,000 articles in this reference work online. From now on I'll be citing Britannica articles on my blog whenever I include information about the subject of my photographs. If you sign up, and you'll have instant access to the world's most famous encyclopedia, with the ability to link to the full article in your blog posts. Your visitors will have access to any articles you link to, but will still have to pay to access the full encyclopedia. I found this storm cloud photo as I was going through my archives searching for images to enter in an upcoming photographic competition. The huge Cumulonimbus cloud is lit up a light pink colour by the setting sun, while the horizon below is silhouetted against the threatening dark blue clouds around the base of the thunder-head. 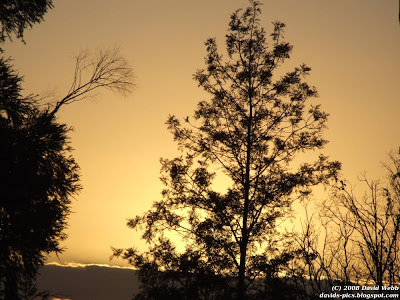 This photo was taken in Goondiwindi, Queensland. 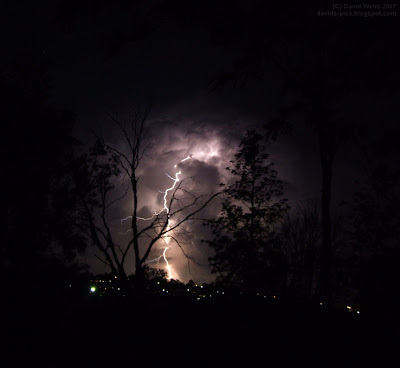 When I entered it into the Goondiwindi Photo Competition, I titled it "Thor's Masterpiece". This Sky Watch Friday photo taken with the Kodak C330 digital camera. This is one of my older photos, taken in 2006 with the Kodak camera. I was experimenting with taking moon photos, and tried out this framing technique with the palm trees silhouetted against the twilight sky, and the fronds reaching from the top of the picture downwards to the moon. I think it turned out fairly well, although the moon is quite small due to the minute 3x zoom offered by the Kodak camera. You can just see the colours of the setting sun reflecting off the top of the palm trees. 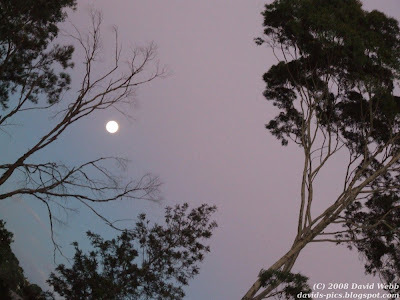 Update: Tom and other readers pointed out that you can actually see a face in this picture - look at the curve of the tree on the left for a nose, and the moon becomes an eye. Thanks Tom! Last Sky Watch Friday, just after I put my post up, I went out to listen to a presentation on the Australian Navy. When I was walking in the door I noticed this brilliant sunset lighting up the sky. I happened to have my camera with me, so I was able to snap a few shots. I didn't have a tripod with me and I used about 250mm lens so I had to bring up the ISO a bit to get a clear picture. By the time I got home from the presentation last Friday it was too late to post these shots, so I'm sharing them today as the Sky Watch for the week. For some reason, whenever it came around to Sky Watch Friday, I automatically thought of a day-time sky. 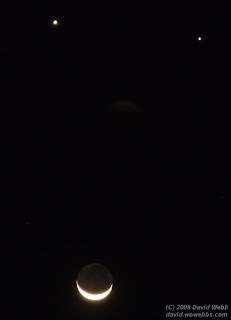 It never occurred to me until now that a moon landscape is actually a "Sky Watch" photo as well! 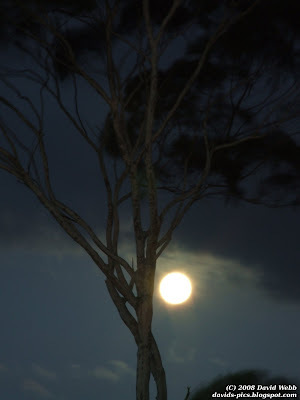 So, today I have this photo I took the other night of a full Moon behind my gum tree (see my other moon / tree silhouette). 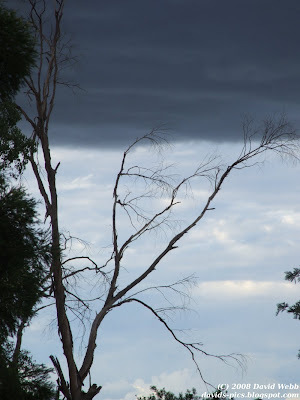 I find the layer of cloud interesting in this picture - it serves to split the picture into two parts horizontally, while the tree splits the picture vertically. 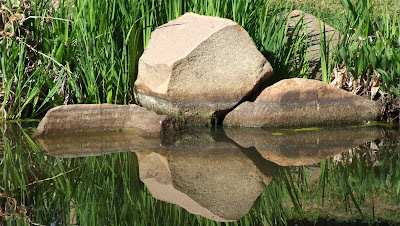 Not exactly the rule of thirds - maybe more like the rule of fourths! Welcome! I hope you enjoy my pictures on this site. If you see one you like, please consider leaving a comment to let me know. I will reply to each comment individually. If you would like to obtain full-size, un-watermarked versions of any of my images for use as desktop backgrounds or other purposes please contact me at davidsnaturephotography@gmail.com. Hello! Don't worry - this is only a test! Liked this site? Help me buy a new camera! We'd like to know what pictures people like - if you see a nice one, leave a comment! David Webb is a photographer based in Australia. He specializes in nature photography, but also enjoys all kinds of photography. 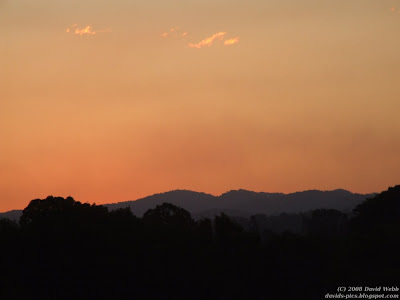 Photos taken at locations in Australia including Brisbane, Goondiwindi, Cairns, Toowoomba, Queensland, Lismore, Sydney NSW. If you are a first-time visitor to this site, you might want to view my welcome message. Copyright © David Webb. All rights reserved. Simple theme. Powered by Blogger.